The Indianapolis Colts today waived wide receiver Da’Rick Rogers and running back Kerwynn Williams from the active roster. Rogers was originally signed to the Colts practice squad on September 2, 2013 and was elevated to the active roster on September 19. In three collegiate seasons, he posted 139 receptions for 2,100 yards and 21 touchdowns in 36 games played. Rogers played two seasons at the University of Tennessee (2010-11) before transferring to Tennessee Tech for one year (2012). Williams was selected by the Colts in the seventh round (230th overall) of the 2013 NFL Draft. At Utah State, he finished seventh in school history with 2,515 rushing yards on 382 carries. He also totaled 22 rushing touchdowns and five receiving touchdowns. Williams’ 6.6 yards per carry average ranks fifth in school annals and his 22 rushing touchdowns ranks seventh all-time. With Delone Carter being traded earlier this week, a few more reps have opened up at the running back position. One back who has gotten a ton of reps for the Colts this training camp is Kerwynn Williams. The 2013 seventh-round draft pick has made the most of those chances. “Every time he touches the ball, he seems to make things happen,” head coach Chuck Pagano said earlier this week. “Whether it’s returning kicks, returning punts, lining up at tailback, he’s done a lot of good things. Against the Bills, Williams returned five kicks for 89 yards, and touched the ball via rush, catch and punt return an additional seven times. The following week against the Giants, Williams had a kick return for 22 yards and two punt returns for 21 yards. Those number of reps should not dwindle as the Colts head into the final preseason games of 2013. “He’s one of the guys that has been somewhat opportunistic as far as getting an opportunity to make a play and of course making the play,” offensive coordinator Pep Hamilton said of Williams. Williams was very politically correct when talking about his first NFL training camp. He feels as if he’s improving each week with the biggest challenge coming with the multiple opposing defenses and picking them up in pass blocking situations. As a late round draft pick fighting to secure his spot on the 53-man roster it’s pretty clear that Williams play alone is doing enough talking. Last time the Buffalo Bills made their way into Lucas Oil Stadium, T.Y. Hilton showcased the skills that have new Colts special teams coach Tom McMahon anxious to see his punt return unit in 2013. Back on Nov. 25, 2012, Hilton fielded a Bills punt at the Colts own 25-yard line. The rookie side stepped two would-be tacklers and allowed his breakaways speed to do the rest in a 75-yard punt return for a touchdown. While the punt returner is virtually set in stone, McMahon said the Colts are still searching for a permanent kick returner. No matter who is back there to field kickoffs come Sept. 8, McMahon has specific goals he is looking for out of his return units. Special teams is filled with hidden yardage and McMahon knows the importance of giving the Colts offense an even shorter field to march. “We need drive starts on kickoff returns, period,” McMahon said. “If we average 15 yards a return but every single one of them is at the 30-yard line, that’s pretty darn good. The men in the trenches poured into St. Elmo Steak House on Thursday night. There was 266-pound Bjoern Werner, joined by a trio of 300+ pound linemen in Hugh Thornton (320), Khaled Holmes (302) and Montori Hughes (329). Those draft picks, along with the entire Colts rookie class, enjoyed an evening at one of the most iconic restaurants in the state of Indiana with plenty of quality food to be had for the Colts first year players. For nearly all of the Colts rookies, the dinner at St. Elmo was their first experience in a restaurant that is routinely nominated for some of the highest awards in the food business. The restaurant has been a mainstay in downtown Indianapolis for over a century and the rookies experienced a variety of St. Elmo’s distinct qualities. Before the Colts rookies could indulge in the steak-filled dinner, an etiquette class briefed the players on fine dining. Next up was St. Elmo’s world famous shrimp cocktail and it’s safe to say that it lived up to hype in the eyes of the Colts rookies. The trip to St. Elmo was the second-to-last trip the Colts rookies will make in the community this offseason. A stop at the Indianapolis Zoo will follow Friday morning before the rookies disperse across the country and then reconvene for training camp in late July. “It’s definitely been a great experience,” Williams said of the rookies touring Indianapolis. It’s been a quiet few weeks for transactions and the Indianapolis Colts. With minicamp beginning this afternoon, Colts GM Ryan Grigson added another major splash in the 2013 offseason as the Colts have agreed to terms with former New York Giants running back Ahmad Bradshaw. How does this acquisition impact the Colts? The Colts are getting a bona fide 1,000-yard rusher who has been apart of a pair of Super Bowl winning teams with the Giants. Bradshaw was the Giants leading rushing in both Super Bowl XLVI and Super Bowl XLII victories, including a 17-carry, 72-yard, one-touchdown (the game winner with less than a minute to play) performance at Lucas Oil Stadium in 2012. Fans should not worry about the durability of Bradshaw as he has missed an average of less than two games per season since 2007. Where Bradshaw, who has played all six of his NFL seasons with the Giants, exactly fits in the Colts backfield remains to be seen. What we know about Bradshaw is he is a consistent threat in both the rushing and receiving departments, and is a physical runner at 214 pounds. Pep Hamilton’s offensive system highlights backs that can run between the tackles and Bradshaw certainly fits that type of runner, along with being a more than adequate pass blocker. How about Bradshaw against the AFC? In 20 career games against his new conference, Bradshaw has averaged 5.4 yards per carry and gained over 1,300 yards. Colts running backs coach David Walker said a few weeks back that although Vick Ballard ended the year as the starter, the team will undoubtedly have to rely on multiple backs in order to get through a 16-game regular season schedule. I see Bradshaw and Ballard forming a very solid one-two punch (both getting ample carries) that is up there with some of the better ones in the AFC. Throw in Donald Brown, Delone Carter and Kerwynn Williams and the Colts have significantly upgraded the depth at a position that needs more than one threat over the course of a season, one that has the potential to last into 2014. Take a look below at the top five pieces from Friday, June 7th. Marot takes a look at the 34-year old Wayne and how the six-time Pro Bowler is adjusting to another offseason with new faces and a new scheme. 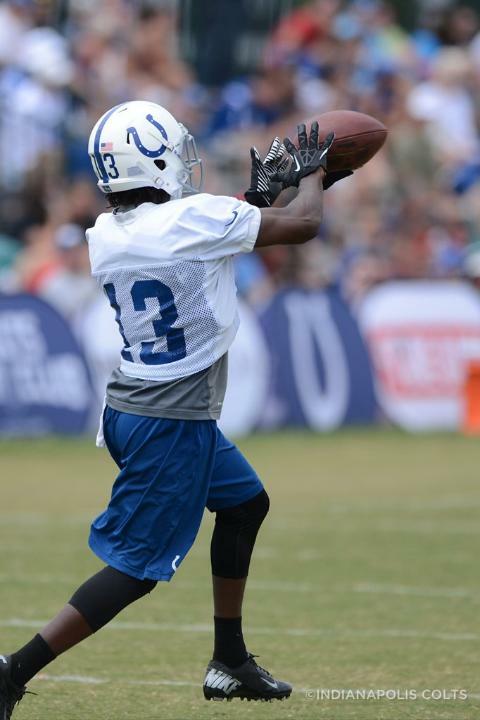 With faces continuing to change around Wayne, he remains one of the most experienced Colts on the entire roster. CBS Sports is taking a look at some of the more intriguing draft picks from this April’s draft and Boyett fits the mold for Indianapolis. Rang analyzes Boyett’s knee injuries that are currently holding him out of OTAs and how that will impact his future at the safety position. As a sixth-round pick, Boyett isn’t likely to overtake Antoine Bethea or Landry as a starting safety for the Colts this season. His reliable open-field tackling and passion, however, could make him a special teams demon and valuable backup as a rookie. Considering that Landry hasn’t started all 16 games since 2008, Boyett’s readiness could be tested earlier than anyone expects. The article also takes a look at first round pick Bjoern Werner and fifth round selection Montori Hughes. On a day when the Colts news centered around Ahmad Bradshaw visiting the team’s complex, Chappell took a look at the running back position in Indianapolis. For more than a decade, the Colts have been more prone to go through the air than carving up yardage on the ground. While the attempts are one thing, Colts coaches look at another stat when evaluating the running game. “It’s not necessarily how many yards we rush for, it’s … how efficient we are when we’re doing certain things,” said running backs coach David Walker. “If we run it 30 times but only gain 30 yards, we really didn’t do much. In Chappell’s blog, he takes a closer look at Bradshaw and how his potential addition may impact the Colts backfield. Chappell believes that Bradshaw would “bolster” the position and says the following about the former Giants running back. Bradshaw, 27, is a proven commodity. He rushed for 4,232 yards and 32 touchdowns in six seasons with the Giants, and topped the 1,000-yard mark in two of his last three seasons (1,015 yards in 2012, a career-high 1,235 in ’10). Burke is running a series on players he expects to breakout in 2013 and Ballard was one of his selections. The article takes a look at a number of reasons on why Burke believes Ballard’s numbers will rise in 2013, including being involved in Pep Hamilton’s scheme. Simply entering the season as the No. 1 back puts Ballard in position for a statistical boost. Ballard averaged just 5.8 carries per game and a measly 13.4 yards from Weeks 1 through 5; over the Colts’ final 11 contests, those numbers bumped to 16.5 and 67.9, respectively. Those averages, extrapolated out over a full season, put Ballard at nearly 1,100 yards. How underrated? Well, just for discussion’s sake, Ballard was the 31st running back taken in Sports Illustrated‘s offseason fantasy mock draft (on shelves in our annual Fantasy Football magazine soon), behind such players as Baltimore backup Bernard Pierce, oft-injured Chargers starter Ryan Mathews, rookies Le’Veon Bell and Eddie Lacy, and unproven Jets back Chris Ivory. Ballard has a very realistic shot to soar past the production of any player listed there — his 67.9 yards-per-game average in his final 11 outings would have been a top-20 mark were it not for his lack of carries in games 1 through 5. The Colts have not had a 1,000-yard rusher since Joseph Addai ran for 1,072 yards back in 2007. If he stays healthy and the Colts do not freeze him out of the offense, Ballard should break that drought. Colts running backs coach David Walker does not live in a fantasy land. In a perfect world, Walker would rely on one main back in 2013 with a backup sprinkled in at opportune times. That’s not how the NFL operates with the rate of injuries that occur on a weekly basis. Names like Delone Carter and Kerwynn Williams might not be focal points heading into the regular season but if history is any indication than they will be relied on in 2013. Carter is entering his third season in the NFL and has battled through injuries to find a niche as a short-yardage runner that accounted for three touchdowns last season. “He’s obviously shown he can do it. He’s been in games his first two years,” Walker said of the 238-pound Carter. Williams is barely a month into his NFL career so any forecast on where he might fit into the running back position will have to wait until the pads are put on in late July. For many rookies, special teams can be an early avenue to immediate playing time and that could very well be the case with Williams at the kick returner position. “He’s a smart kid, a good learner, a good worker,” Walker said of Williams’ prognosis at running back. Last season it was Vick Ballard and Donald Brown that dominated the backfield for the Colts. But people should not forget Delone Carter’s hard-nosed running late in the Colts overtime victory over the Titans. Walker feels he’s got a group of guys that bring different skill sets within the Colts offense and sees contributions coming from a number of players. Kuharsky offered a notebook synopsis on the past week for the Colts. He covered the draft pick signings of the Colts, a brief look into specific draft picks, and a bit of rookie minicamp. Most of the information includes links to specific articles from the Indianapolis media. Looking for the most pertinent information all things AFC South than Kuharsky’s blog is a must read. A familiar name to Colts fans has found a home in the AFC South. “Mookie” Antonio Johnson returns to the Tennessee Titans after five seasons in Indianapolis. Kuharsky tells the story of Johnson being singed off the Titans practice squad back in 2008 when the Colts suffered a rash of injuries along the interior of the defensive line. The signing off of another team’s practice squads was a bit of a surprise as Polian did not do that often during his time as Colts GM. This area usually is reserved for strictly Colts topics but King’s MMQB is too good not to include. King focuses on Manti Te’o’s first day being included with veterans as the Chargers start-up OTAs again with the rookies in southern California. Charges head coach Mike McCoy gave King some insight into how Te’o will exactly fit into the Chargers scheme.